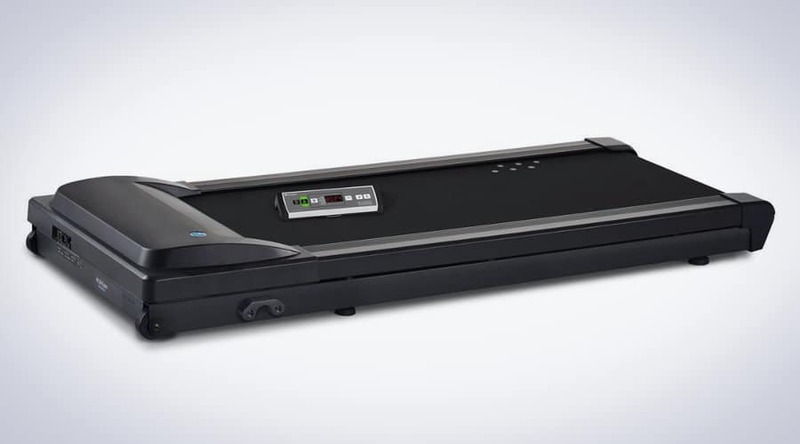 From the 5 products we researched, the LifeSpan TR-1200 DT3 Treadmill Desk is our overall favorite and what we believe to be the best under desk treadmill in 2019. 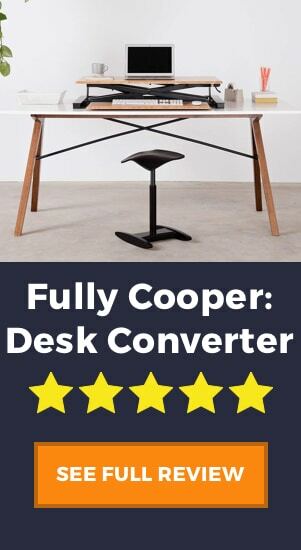 This desk has amazing features and is most likely to suit the needs of people who wish to create their own walking desk, and in terms of value-for-money we found it hard to beat. The other products which we highly recommend are the iMovR ThermoTread GT, a high-end, high-quality under desk treadmill from the same company that creates some of the best standing desks on the market. 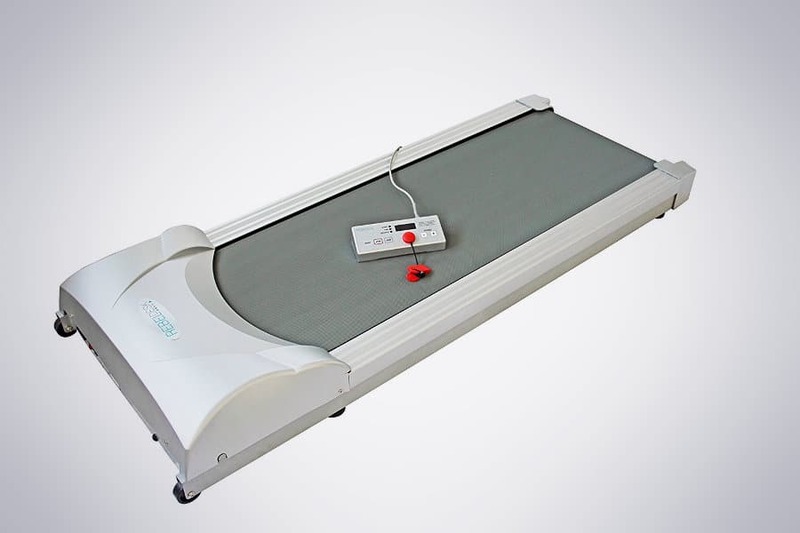 Finally, if you are looking for the best cheap under desk treadmill then we think you’ll love this product from Titan Fitness, the most affordable product on our list. An under desk treadmill, sometimes called a treadmill desk, is a fantastic product for getting more active at the office. Many people are looking for ways to live less sedentary lifestyles, burn calories at the office, or don’t have time to go to the gym, and a treadmill workstation is a great way to do all these things. 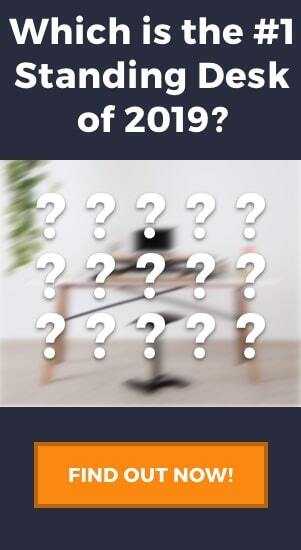 Take a look at the table above to get a quick overview of our favorite products. Each of these products was picked for its usability, functionality, build-quality, and most importantly for the number of positive reviews it receives from its users. There are a number of different styles of treadmill desk, and you can see how to select these in our buying guide. For this article, we have made the distinction of only selecting treadmill bases and not a full treadmill with a large front panel. Moreover, we have selected products where the treadmill base is sold separately from the desk, as many treadmill desks come as a single unit with the desk included. First up on our list is the ThermoTread GT by iMovR. If you’ve seen some of our other articles you’ll probably already know the brand iMovR because of their amazing standing desk products, in fact, one of which we consider one of the best standing desks on the market. iMovR is well-known for their high-end ergonomic products that are well-built, solid, and functional, and the ThermoTread GT is no different. 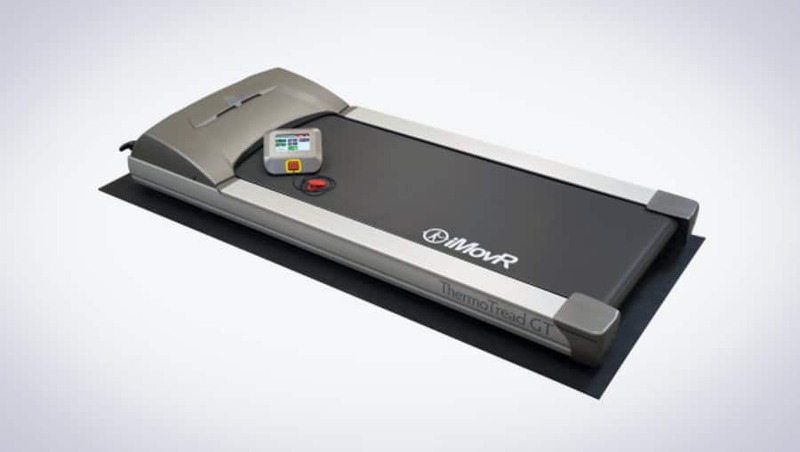 The iMovR ThermoTread GT was purposefully built as an office treadmill, so everything the company has done in creating this product has been with that in mind. This we can see straight away with the overall noise production. This is one of, if not THE quietest treadmill desk available, producing less than 43 dB of noise. We also really like the digital display that controls the treadmill. It is a touch-screen LCD panel that sits on top of your desk while you walk. From here you can see the time, distance, and calories burned. You can also adjust the speed settings and set different breaks using this display. A number of factors make this product also very sturdy and capable of holding and functioning with heavy weights. Firstly, there is the motor function, which for this product is 3.0 HP. Then there is the solid 1″ deck which supports the user’s weight, as well as 6 compression shocks which absorb the shock in each step. Lastly, the treadmill has a robust build complete with aluminum side rails, not only making it strong but also making it easy to get off and on the treadmill. Lastly, iMovR provides a 3-year warranty on this product, so if you encounter any issues during the first three years then the company will fix the product for you. With any product with moving parts, electronics, and a motor, a warranty is always an added bonus. The primary concern for most people when buying a new product is the cost. You must make sure that you stay within budget and you can buy something that is affordable, and most importantly good value for money. Well, we must say that this product is good value for money, meaning that although it is more expensive, you get a high-quality product in return. However, once shipping costs are is factored in this is the most expensive product on our list, so people looking for an under desk treadmill on a budget may want to look elsewhere. This is also the largest and heaviest product that we have selected. Although this is not a complete deal-breaker, as you see that it is only fractionally larger and not too much heavier than the others. 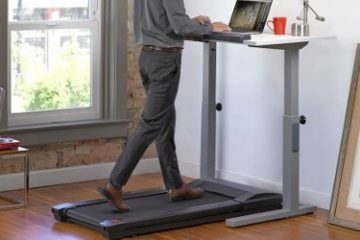 This should be a consideration for those who are looking for more portable treadmills for office use. Lastly, there is a limited speed range that we believe is worth considering. Other treadmill desks reach a maximum speed of 4 mph whereas the ThermoTread GT only goes up to 2.5 mph. iMovR have done this on purpose for safety reasons and also they believe that walking faster than this will affect your working ability, but with think that there are some people who would want the extra speed offered in other products. 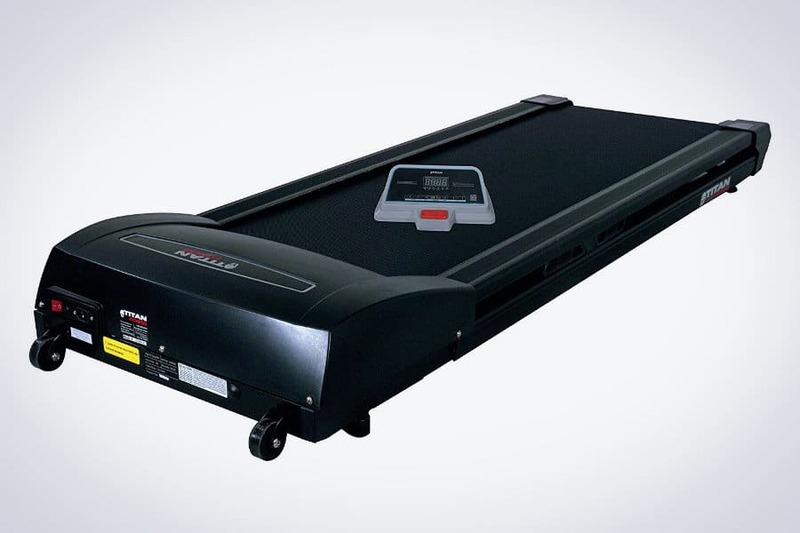 The Rebel Treadmill 1000 is a mid-low range under desk treadmill that has received plenty of praise from its users. The product is small, compact, light-weight, and is one of the cheaper products on the market. If you want to know more, take a look at our full review of the Rebel Treadmill 1000. By far the best feature of the Rebel Treadmill 1000 is its size and weight. It has the smallest footprint and at 88 lbs is by far the lightest product in our list. For a product that is designed to be portable and for office use, this is a real advantage of this desks over the competition. The Rebel Desk 1000 is also one of the cheapest treadmill desks available. It seems the company has forgone some extra features, ones that aren’t completely necessary for this type of office exercise and have created an affordable and great value-for-money unit. Despite its low price, the Rebel 1000 is still very reliable and well-built, including a small but reliable motor and sturdy frame. This product also has a pretty good warranty in case anything happens to stop working. The parts have 1 year warranty, the motor has 2 years, and the frame has an astonishing 20 years. Not only that, there is a 30-day 100% money-back guarantee in case you don’t think that you have made the right purchase. For a mid to low-end product, the Rebel 1000 has everything you really need, but as we said before some functionality has been sacrificed to make a really light-weight and affordable product. One of these factors is the console. The console is small and can display the speed, time, and distance, and allows you to adjust the speed. It is a small console with a couple of buttons and a small number display, but that is all. Another factor to consider, and one we mentioned with the iMovR, is the small speed range. In fact, the Rebel 1000 has even a lower top speed than the iMovR, going to a maximum of 2 mph. Many people would argue that this is plenty for LISS training (Low Intensity Steady State cardio) and is perfect for standing workstations, however, there are products that go twice this speed. This is another area in which you, the user, have to weigh up the cost to benefit of this feature. Lastly, this product has a low weight capacity, only working for users up to 250 lbs. This is by no means a deal-breaker as most people fit into this category but if you are heavier and are looking for a sturdy under desk treadmill, then you might want to look at the other products on our list. The first of two LifeSpan products that appear in this list, the TR5000-DT3 is a high-end, heavy-duty, and powerful under desk treadmill. LifeSpan fitness has a number of fitness-related products and is well-known in the health and fitness industry. This treadmill is what we consider high-end for its higher price tag and also its better functionality and product features. There are a couple of significant differences between this product and its cheaper version, the TR1200, and these are the motor, the side rails, and the price. Obviously, the price is affected by the two former features. The TR5000 has a 3.0 HP motor which, along with the iMovR, makes it the most powerful motor on this list. Moreover, the TR5000 is built with very solid and sturdy aluminum side rails. Of all the LifeSpan under desk treadmills, this one is by far the sturdiest and most robust, and these side rails would withstand a fair amount of wear and tear. The running deck has 6 shock absorbing compression points, which is great for two reasons. Firstly, this makes the deck a bit quieter for every footstep that you take. Secondly, and most importantly in our opinion, is that the compression shocks work as a sort of suspension and will make walking (or running) significantly better for your ankles, knees, and hips. If you suffer from joint pain when you walk, the compression shocks will be a huge game changer for you. The LifeSpan products also have the best range of speeds of all the products on our list. You can easily adjust the speed of the treadmill between 0.4 and 4.0 mph, controlled by a small and discreet control panel. This panel also has a small USB charging port, perfect for charging cell phones and other small items while you walk. A treadmill desk may not be the right choice for everyone. See whether cycling at your desk, or many other forms of office exercise, could be a better option for you. It was difficult for us to find too many issues with the LifeSpan TR5000, as it is truly a well-rounded product. One thing to note, however, is that we consider this a high-end product, and as such it carries a more high-end price tag. As always, you get what you pay for so the LifeSpan TR5000 will definitely be a good product for you, the real question just comes down to whether the price is within your budget or not. Despite the compression shocks which help make the product a lot quieter, the motor of the TR5000 produces more noise than the iMovR. Although not extremely loud, this little bit of extra noise might be annoying in an office environment and it could be worth considering the quieter iMovR ThermoTread GT. The next product on our list is another fantastic item from LifeSpan. LifeSpan has a huge range of treadmills and this one could be considered the smaller brother of the previous one in our list. It has a slightly less powerful motor, plastic rather than aluminum side rails, and a smaller weight capacity, and at two thirds the price! As we mentioned already, this product is only two thirds the price of the LifeSpan TR5000. This difference in price obviously comes a the cost of a few product changes, but in the end, the functionality of the LifeSpan TR1200 is almost as good. Another benefit of the LifeSpan TR1200 is the belt size of the treadmill. On a high-end product you can expect a larger belt size, but generally, on the mid-range products, the belt size is smaller. This product combines a mid-range value with a larger belt size which makes the treadmill a little more comfortable and easier to use. The extra belt size also adds to the level of safety, as you are less likely to step off the machine while walking. Despite having a smaller motor, the TR1200 still boasts the great speed range of its bigger brother. Adjustability from 0.4 – 4.0 mph gives people who are looking for brisk walking and more intense workouts greater speed adjustability. Finally, the warranty of the LifeSpan TR1200 is a huge value add in our opinion. The motor has a 3-year warranty, the parts have 2 years, and the frame has a lifetime warranty. That’s a pretty good sign that LifeSpan is confident in the build of its treadmill. As we mentioned before, the motor of the TR1200 is weaker than the TR5000, only producing 2.25 HP as opposed to 3.0. This has an impact when it comes to the maximum working capacity of the product, which for the TR1200 is 50 lbs less than the TR5000. We don’t see this as much of a deal breaker, because 350 lbs is still a considerable working capacity and even more than the iMovR which is considered a much higher-end product. The other feature to consider is the use of a plastic frame. Many people love the aluminum frame of the TR5000 as it is solid, robust, and can withstand even the roughest users and poor treatment. Plastic, on the other hand, is just inherently less solid and this might be something to consider. Although, in saying this, LifeSpan does have the lifetime warranty on the frame, so you can be pretty sure that the plastic will also hold up to general wear and tear. 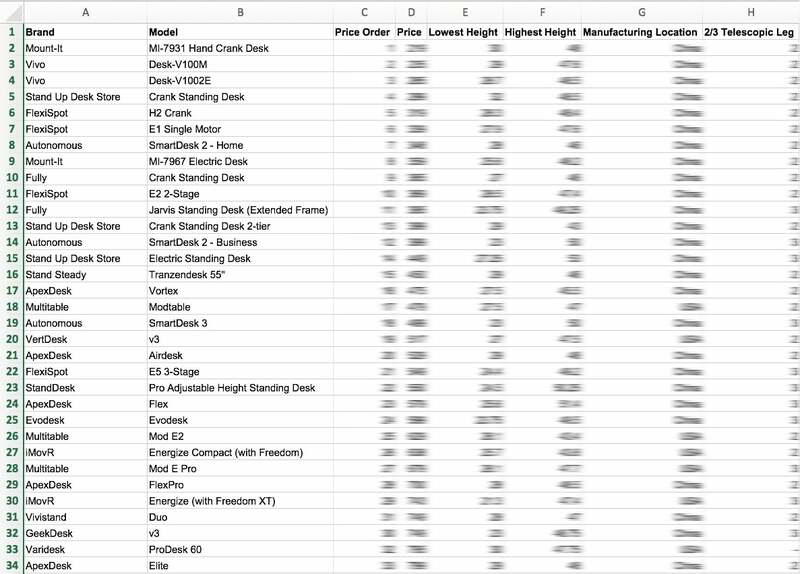 If you’re looking for a cheap treadmill desk, then you don’t have to look any further. The Titan Fitness Under Desk Treadmill is far and away the best value product on the market. It is well-built, compact, and has a great top speed. The best thing is, it costs less than $500! It really comes as no surprise to see that the best thing that we like about the Titan Fitness Desk Treadmill is the price. At under $500 it is by far the most affordable product in this area, and some would argue that the value-for-money is second-to-none. If you are looking for an under desk treadmill that is cheap, then you can’t go wrong with the Titan. Despite its price, the Titan actually competes with the other products for the fastest top speed. The Titan reaches an impressive 4.0 mph, the same as the LifeSpan products, and actually beats a few of the higher priced items in this domain. Although running is not recommended for this product, there would be many people who would enjoy a brisk walk while working. Lastly, this treadmill is very quiet and even though it doesn’t have the same compression shocks as some of the other products, it still is able to be quiet enough for office use. This is also due to the motor, that even while at top speed will not create too much noise. The Titan under desk treadmill has one of the lowest weight capacities of the products on our list. Suitable for users only up to 250 lbs, the Titan is clearly not as robust as the other products. But remember we are dealing with a low-cost product, and you have to consider whether the extra sturdiness is worth the extra money. The major issue that users have with the Titan is actually not with the treadmill base, but with the console. Unfortunately, this console is fairly basic and just shows the speed, distance, and time on a loop. You are not able to control which of these settings you see, it is just a timed endless loop, and another thing is that if you stop using the treadmill then these statistics will disappear. For people who like to track their stats, you’ll have to do so while still walking on the machine, otherwise, they will no longer appear on the screen. Another option is to track your workouts with a fitness tracker like a Fitbit or Apple Watch. Choosing the best under desk treadmill, in the end, is a matter of priorities. None of the products can have every feature possible, and you’ll never find a cheap, compact, robust, strong, full-featured, and fast desk treadmill. What you can do though, is weigh the pros and cons of each product to find one that suits your lifestyle. Are you just starting with walking at your desk and don’t need a fast treadmill? Then maybe save yourself the extra dollars and go for a cheaper product. Or maybe you are super fit and really need that extra speed, even if it means a bigger, heavier, and more expensive product. The choice is up to you.